Tuesday lunch bento was ’empty your fridge’ salad made out of leftovers in the fridge. 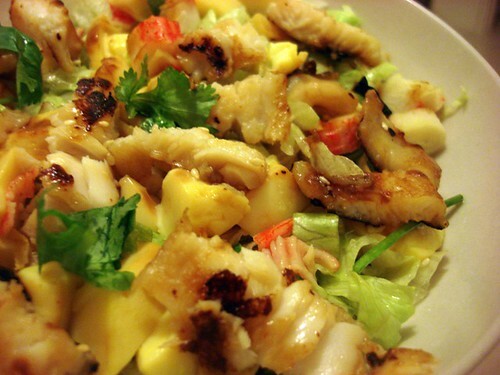 Included tofu, crabsticks, bamboo shoots and teriyaki fish with sesame, lime and fish sauce dressing. Quite good eaten straightaway but not great for the day after. 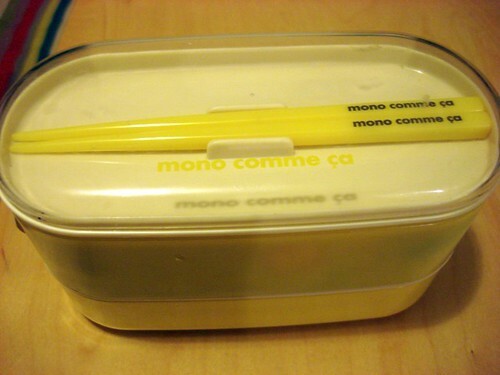 I always try to prepare Jo’s lunch bento on Wednesdays because she has to go to work straight after. 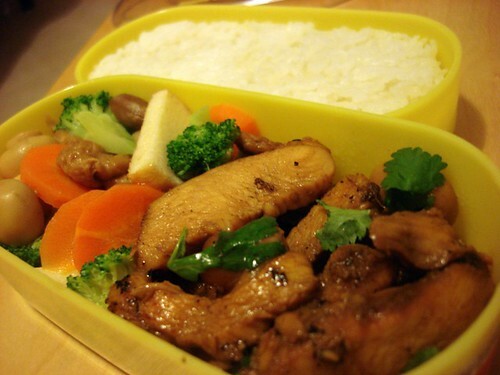 Her lunch bento was stir-fried five spice honey chicken and mixed vegetables with rice. Luckily I didn’t have to do the ‘A week of my life’ meme this week. Because the weather had been horrible of late, rainy, gloomy, dark and wet. I shiver when I go out and I shiver when I go home. I don’t know why I used to say I like winter, winter is horrible! It doesn’t help that I’ve been leaving the office later and later. Usually I am the only one left with all the big bosses around. Sometimes I think to myself ‘what the hell am I doing here? I’m just a minion!’ I think I haven’t seen the sun all week (T____T). Today it was another late workday. By the time I got out of the building it was pitch dark and drizzling. Two blocks before I reached my bus stop, I saw my bus rolling down the terrace. To run or not to run? I ended up running after the bus in the rain while trying to keep my shoes from falling off (for some reason they’re so loose lately). I collapsed on the bus seat, panting and thinking ‘there’s got to be a better life than this’ (ya, can swim 100 laps but can’t sprint two blocks, I’m so unfit). While walking home from the bus stop, I wondered what to cook for dinner. The supermarket and veg shop was closed, any meat in the freezer would be rock hard. Then Jo called my mobile ‘where are you?’ ‘Err walking home on the road’ ‘Oh I’m at the lights waiting for you, scared you walk home in the dark alone’ ‘But doesn’t it defeat the purpose when you’re there alone?! Dangerous for you also what!’ ‘No, I’m at the lights, lots of cars!’ *slap forehead* Sigh, still it was very sweet of her but please hor Jo, wait for me at home! So I decided to reward both of us for walking in the rain and said ‘Let’s buy takeaway for dinner’. We were deciding between kebabs and Subway. Guess what we had in the end? Jesters pie! 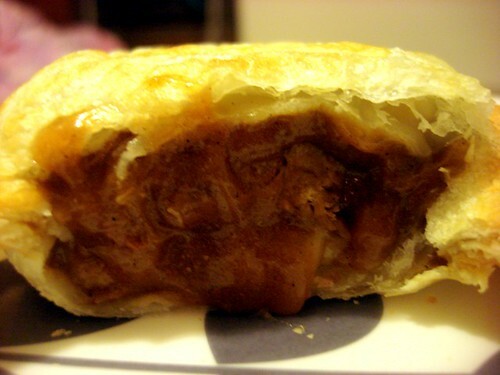 Jo’s Footy pie which is chunks of lean beef with bacon and mushrooms topped with tasty cheese. Looked very nice and oozy. Mine was a special and not on their normal menu! 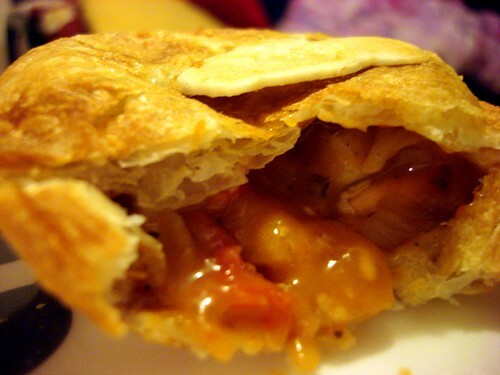 It’s a Peri Peri pie which had chicken chunks, potato and carrots in a slightly spicy peri-peri sauce. Not bad but then I don’t really like potatoes in pie. Still, the puff pastry was very yummy and it was fun having a pie for a change. Btw, I’ve added a new ‘sometimes you just need a’ category in my list, it’s for those posts where I succumb to temptation and just think ‘what the heck, sometimes you just need a …’ so far I’ve had curry, sushi and pie (^__^). Once I’ve decided on the ratings system I will put it up on my About page. Haha, I just had a chat with my mum, we were gossing about the latest tvb dramas and she said ‘Eh, that drama is REALLY HORRIBLE! !’ Then she said ‘You must watch it!’ I started laughing and said ‘ how come you say it’s really horible then you ask me to watch it? !’ She said ‘because you must watch it to see how horrible it is mah!’ My mum very cute hor Y(^___^)Y. Remember to do a post on your mum’s ‘favourite’ japanese eatery in Perth,’taka’. Ya will find time to go and eat at your favourite place in Perth, hahaha. You know, we never brought Jan and Andy there! 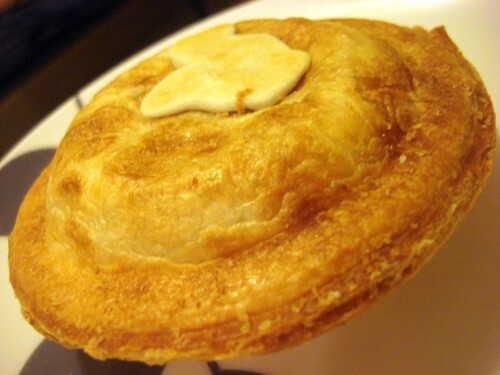 OHHH MMMYYY..the meat pies making me super hungry now!!! I love both pies..but never tried the peri2 one…but i thought it surely taste yummy cos’ I like peri2 sauce.